It has been awhile since I made it across the hill to John's Market, but Clark was interested to see it while he was in town, so we went. I was finally able to procure a couple bottles of Uerige Alt and Uerige Doppelsticke -- true Dusseldorf Altbiers -- which I had been wanting to do for some time. They weren't cheap -- about $4.50 for a little 11 oz. bottle -- but the bottle is kind of cool looking, with a stopper cap. Maybe someone will fill it with homebrew for me. My ragged German-English dictionary doesn't have the word "sticke", and neither does Google Translate. So we turn to the Uerige website itself, which says it means "whispering" in an older dialect. 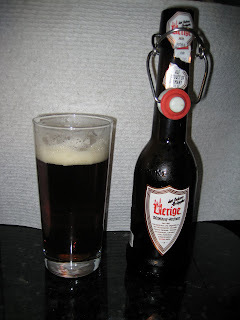 I think they're implying that Uerige Sticke is a seasonal that people talk about a lot; or maybe you can interpret it as a secret beer, and hence the Doppelsticke is a double-secret beer. Despite the exciting prospect of a double-secret Alt, I prefered the 4.5% regular Alt to the 8.5% Doppelsticke, which I found to be too syrupy. When I recently rediscovered my notes from the 2007 PIB on Lee's blog, I noticed that I had tried the Doppelsticke and been disappointed in it, describing it as "sweet, not long". I had forgotten all about it by the time I got obsessed with alts this spring. If I have another Uerige it will be the regular Alt, not the double. In Portland it's probably wiser to go with the fresh local stuff at Widmer. Man, it was fun to go to John's Market. I love the selection at Belmont Station, but John's Market turns it up to eleven.